My letter did not get down to the PO in time to send in the morning, so I laid it over till tomorrow morning. I came of [sic] Guard this morning at 9 AM & have been trying to sleep all day. To night at 5 PM, we had Dress Parade & our Promotions were read. [Harvey] Warren1 was reduced to 5th Sergeant & a Dutchman by the name of Louis Dryer2, was promoted from 6 Corporal to 3rd Sergeant. It makes me so mad to think a Dutchman over me. he can talk hardly plain yet. I am promoted to 5th Corporal, a Big Thing. One of the Corporals put in are C Catlin3 of Sodus, to 7th & L S Rogers4 of Lyons to 8th. 1 ?Warren, George H.–age,27 Enlisted 6 Aug 1862 at Lyons to serve three years; mustered in as sergeant, Co. D, 20 Aug 1862; killed in action, 5 May 1864, at The Wilderness, VA.
2 Dryer, Lewis –age,27 Enlisted 6 Aug 1862 at Lyons to serve three years. Discharged for disability, 4 Jul 1863. 3 Catlin, Charles M.–age,20. Enlisted 9 Aug 1862 at Sodus.Captured in action 25 Aug 1864 at Reams Station, VA.; paroled, no date. 4 Rogers, Luther S.–age,19 Enlisted 6 Aug 1862 at Lyons to serve three years. Promoted corporal, no date; killed in action, 5 May 1864, at The Wilderness, VA.
5 Green, Augustus W.–age,22 Enrolled 7 Aug 1862 at Sodus to serve three years. Mustered in as sergeant Co. D, 20 Aug 1862; promoted first sergeant, no date; mustered in as first lieutenant, 28 Nov 1862; wounded in action, 5 May 1864, at The Wilderness, VA.; discharged to disability, 7 Sep 1864. 6 Cookingham, Charles L.–age,18. Enlisted 6 Aug 1862 at Galen. Wounded in action 3 Jul 1863, at Gettysburg, PA.; killed in action 5 May 1864, at The Wilderness, VA.
7 Dryer, Lewis–age,27 Enlisted 6 Aug 1862 at Lyons to serve three years. Discharged for disability, 4 Jul 1863. 8 Warren, George H.–age,27 Enlisted 6 Aug 1862 at Lyons to serve three years; mustered in as sergeant, Co. D, 20 Aug 1862; killed in action, 5 May 1864, at The Wilderness, VA.
9 Penoyer, Ira–age,27 Enlisted 5 Aug 1862 at Sodus to serve three years. Wounded in action, 3 Jul 1863, at Gettysburg, PA.; died of his wounds, 9 Jul 1863. 10 Contant, Adrian–age,19. Enlisted 11 Aug 1862 at Marion. Captured while on picket 1 Dec 1863, at Mine Run, VA.; released 24 Feb 1865, at Aikins Landing, Va; mustered out, 2 Aug 1865, at Rochester, NY. 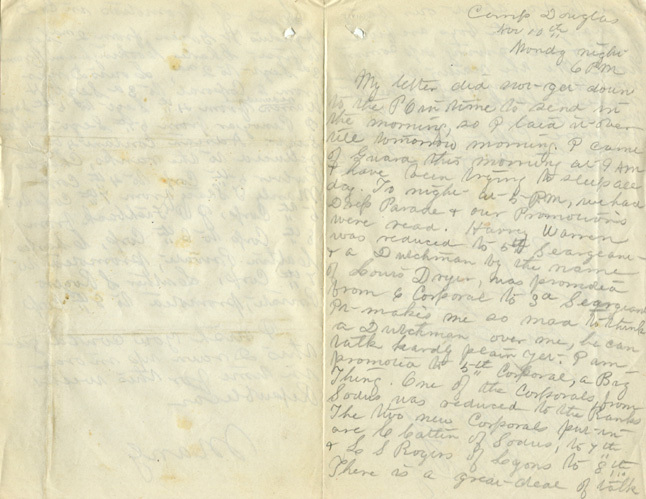 11 Pulver, Charles A.–age,30 Enlisted 30 Jul 1862 at Sodus to serve three years. Promoted corporal, no date; discharged, 18 Dec 1863, at Chicago, IL. 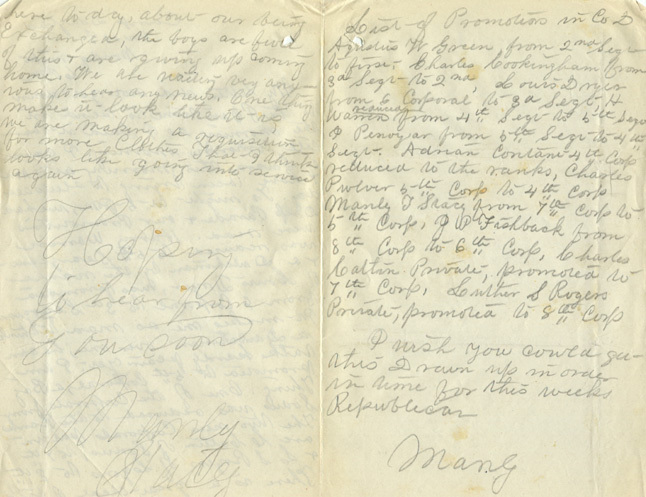 12 Stacey, Manley T.–age,20 Enlisted 6 Aug 1862 at Lyons to serve three years; mustered in as corporal, CO. D, 20 Aug 1862; killed, 26 Dec 1863, accidentally shot; borne as Manley L. Stacey. 13 Fishback, John P.–age,21 Enrolled 9 Aug 1862 at Lyons to serve three years. Mustered in as corporal, Co. D; promoted sergeant major, 1 Sep 1863; wounded in action, 6 May 1864, at The Wilderness, VA.; mustered in as first lieutenant, Co. H, 4 Dec 1864.